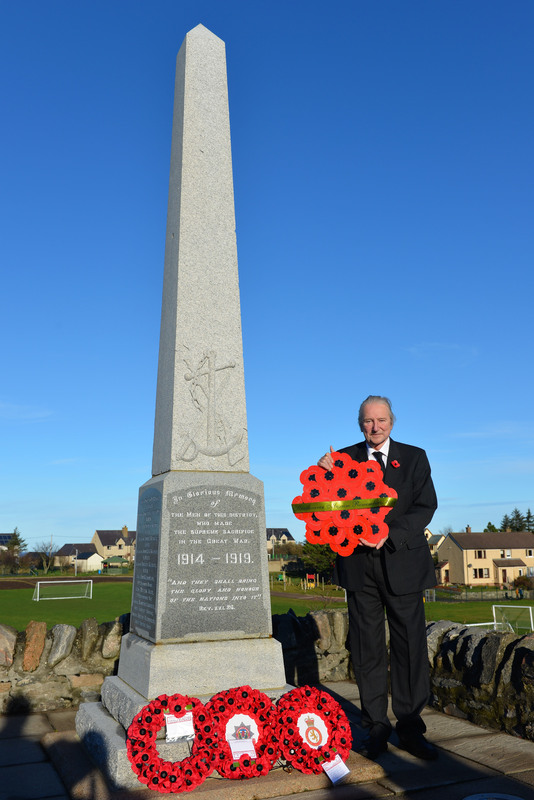 A larger than usual crowd, boosted by the national centenary activities and by the beautiful weather, turned out at the Bettyhill War Memorial at 10.45 this Sunday morning for the annual Remembrance Service. Officiating was the Reverend Dr. Beverly Cushman, Church of Scotland minister in the recently linked parishes of Altnaharra and Farr and Melness and Tongue, whose address urged remembrance not only of those who fell a hundred years ago but also the hundreds of thousands of their successors who paid the ultimate price during subsequent conflicts in both the 20th and 21st centuries and hoped that all would continue to be remembered ‘in a nation of service and a world at peace’. 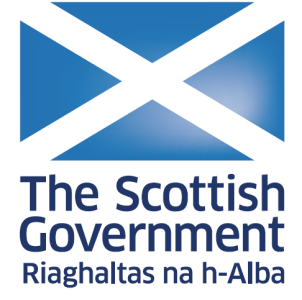 The lament, played on the pipes by Miss Shona Munro, was followed by the two minute silence after which, for the first time, a total of four wreathes were placed on the memorial. 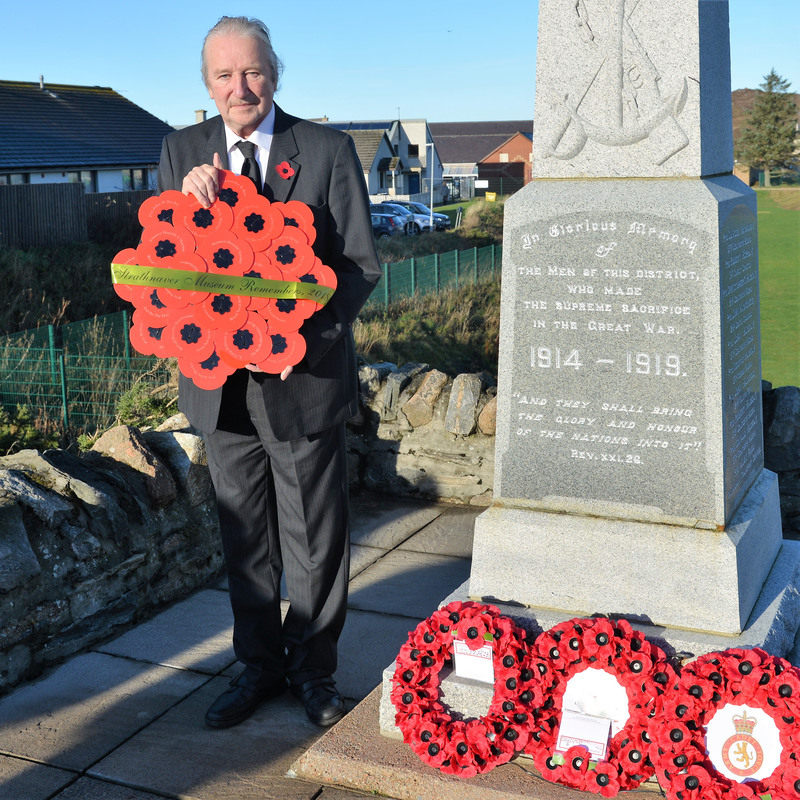 The first, the end-product of Strathnaver Museum’s four years of remembrance activities, was laid by Mr Tommy Mackay, Chair of the Museum’s Board which bore the names of all those honoured on the War Memorial, a tribute which extended to all the Remembrance Services in the Mackay Country from Melvich to Scourie. Next came the Community Wreath, laid by Mrs Jenny Johnston, many of whose relatives on both sides of her family had served their nation in war. The third, on behalf of the emergency services was laid by firefighter Mr Johnny Macdonald, a former Highlander with service in Afghanistan, while the final wreathe, on behalf of the Farr High School Army Cadet Detachment, was laid by Cadet Sergeant Tristan Jack. 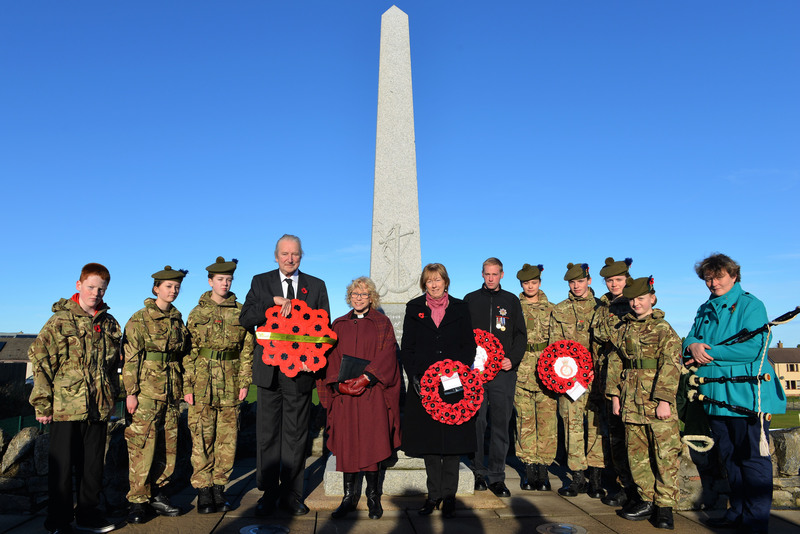 Two other members of the detachment also took part in the event with Cadet Lance-corporal Heather Mackay reciting an extract from Laurence Binyon’s famous poem, For the Fallen, and Cadet Murron Drennan reciting the Kohima Epitaph. Indeed it had been a very busy weekend for the Cadets starting on Friday at Farr High School’s Remembrance Service where the unit’s two Lance-corporals, Carys and Heather Mackay, together with Cadets Eloise Bishop and Tia Mackay spoke to the school about the last day of the First World War. On Saturday all cadets attended the Poppy Tea in Tongue where, after reprising some of their performance in school, they went on to the cemeteries at Tongue, Melness, Bettyhill and Skerray where they placed wooden Remembrance Crosses on the graves of those who had died in both world wars. 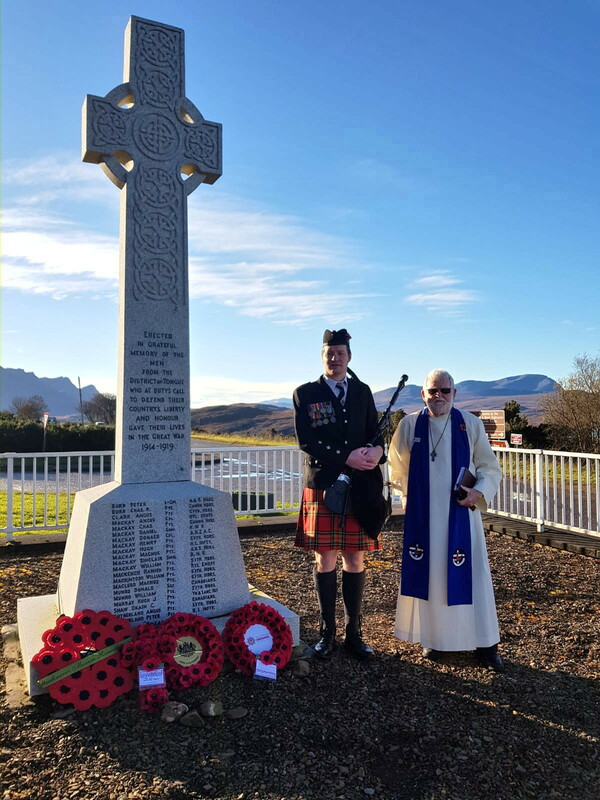 In addition to their participation in the Bettyhill Service on Sunday, they attended ceremonies at Melvich, where Cadet Lance-corporal Carys Mackay laid a wreath, at Talmine where Cadet Sergeant Tristan Jack laid the wreath and at Skerray where Cadet Lance-corporal Heather Mackay did the honours. And finally, Cadets Eloise Bishop and Tia Mackay laid the personalised Museum wreath on behalf of the community. Cadet Matthew Gunn, Cadet Mica Munro, Cadet Hope Watson, Mr Tommy Mackay, the Rev Dr Beverly Cushman, Mrs Jenny Johnston, Firefighter Johnny Macdonald, Cadet Murron Drennan, Cadet Sergeant Tristan Jack, Cadet Eloise Bishop, Cadet Lance Corporal Heather Mackay and piper, Shona Munro. and 3. Mr Tommy Mackay with the Strathnaver Museum personalised wreath.